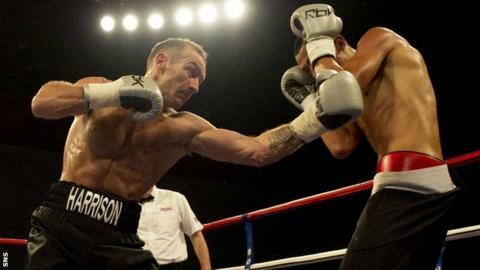 Scotland's WBO lightweight champion Ricky Burns' next title defence may be against countryman Scott Harrison. Promoter Frank Warren says it is a distinct possibility the winner of Saturday's title fight between Burns and Kevin Mitchell could face Harrison. Harrison, who is on Saturday's undercard, has recently returned to the ring after a seven-year absence during which he spent time in jail. "If he looks the business then we'll deliver for him," said Warren. The 35-year-old former world champion is up against an as yet unnamed opponent at Glasgow's SECC, having seen off Hungarian teenager Gyorgy Mizsei Jr in his comeback fight. "At the moment he seems to have his life on track," Warren told BBC Scotland. "He has focus and direction and I hope that continues to be the case. "If he looks good in the ring and has a couple more fights it certainly wouldn't be a problem for me to put the winner of this one [Burns v Mitchell] against him. "He's had a lot of problems over the years, most of them self-inflicted, but he's straightened himself out and when people turn their lives round you have to give them some encouragement and support. "Now it's up to him. It's in his hands." Harrison admits he finds it tough to motivate himself for minor fights but the prospect of another title bout is keeping him going. "It's going to be a cracking fight between Ricky and Kevin Mitchell," said Harrison. "Hopefully in the next fight after this one I will fight the winner. I will know in the next two fights so hopefully that will happen. "The first fight couldn't have gone any better. Training was perfect, the fight went well, after the fight, everything. "It was a good night, I hadn't boxed in seven years. I had been in prison for three-and-a-half years so to get back in front of the fans again was a dream come true. "I won my first world title when I was 25. I'm now nearly 35. I was suspended for five years. "Obviously Saturday night is a big occasion. I had 11 world title fights and to be back in about it again, I'm looking forward to the future. "I'm buzzing but eight-to-10-round fights don't really get me up for it. I need world title fights. "But I know I need to get the job done."